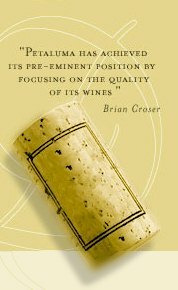 A distinguished site is a unique site, which by virtue of its natural attributes, consistently produces distinctive wines of the highest quality. A defining moment for a winemaker is the discovery of the special chemistry between a distinguished vineyard site and a noble grape variety. 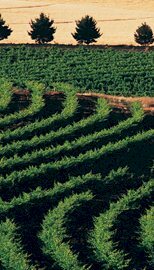 Petaluma has invested in distinguished vineyard sites in South Australia in order to produce wines of world class standard. Petaluma has two vineyards in the Coonawarra, known as the Sharefarmers and the Evans. Due to heat summation, Coonawarra is ideally suited to the Bordeaux varieties and is one of the world's greatest Cabernet Sauvignon regions with wines having uniquely fine-grained tannins. The climate is dominated by the cool winds from the ocean and is moderately maritime despite being influenced by the hot air of the flat plains to the north during summer. The fabulous Terra Rossa red soil family of the Coonawarra ridge has been formed on an ancient sand dune. The calcrete limestone deposit below the Terra Rossa soil was formed by the action of rain on calcium carbonate marine deposits during the soil genesis. The Clare lies in a valley at the northern extension of the Adelaide Hills, 145km from Adelaide. Clare Valley arguably produces Australia's best Riesling and Petaluma's Hanlin Hill Vineyard provides the fruit for Petaluma Riesling, recognised in Australia as the best of this traditional dry style. The geology of the Hanlin Hill Vineyard is Mintaro shale, deposited as shallow marine sediments between 550 and 600 million years ago, and metamorphosed into high quality grey slate, which has weathered to form well draining, brown to red-brown clay rich soils. Petaluma has chosen Mount Barker on the eastern boundary of the Adelaide Hills to grow Shiraz and Viognier in the B&V Vineyard. The geology of Mount Barker is based on granitic micaceous schists associated with quartzite which produce well drained sandy loams of moderate fertility ideally suited to control the natural vigour of Shiraz. The B&V Shiraz develops strong blackcurrant aromas with some black pepper and liquorice nuances. The rich ripe aromas and flavours typical of Australian Shiraz are evident but there are extra dimensions of floral and spice more typical of cooler region Shiraz. The Piccadilly Valley at the centre of the Adelaide Hills lies immediately to the east of the city of Adelaide behind Mt Lofty, the highest peak of the Adelaide Hills at 2,400 feet. The Piccadilly Valley is the home of Petaluma and its famous Chardonnay and Croser sparkling wine.